Tired of flat tires causing you lost money and lost hours? 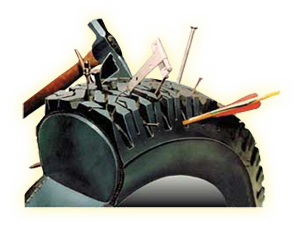 Roadrunner Rubber Corp provides poly-fill services for your pneumatic tires. From wheelbarrows to the largest equipment in the world, we replace the air in your tires with our flat proofing polymers giving you the same ride as your air tire but without worrying about another flat tire. Our poly-fill replaces air in tires with a resilient liquid compound that cures to a soft rubber core within 24 hours. The poly-fill core makes tires impervious to nails, spikes, rocks, slag – even bullets. By preventing flats, we can help eliminate downtime and costly repairs. Our Poly-Fill technician will fill your tires quickly and cleanly, with the quality and service our customers expect from Roadrunner Rubber! The best equipment and our commitment to quality service make the difference!